Swimsuit worn as top: Solid and Stripes. Skirt: PartySkirt. Hat: Eugenia Kim. Bag: Mansur Gavriel. Sunglasses: Old, similar here and here. Flats: Chanel (similar here and here). Location: Hamilton Princess & Beach Club. Looking flawless!! I'm loving this shabby chic outfit! I always find inspiration here 🙂 fabulous look! what a beautiful and original summer look! Such a pretty outfit! I love the colors together! Perfect photos! I fell in love with the skirt. I'm so so in love with this look! The palm leaf printed pieces are super pretty and fun, but it's so refreshing that you matched it with pink and white stripes! the photography is absolutely amazing! Very nice skirt! I love it! It's a great idea to wear a swimsuit as a top! The prettiest mix of prints! Green palms and pink stripes, perfect. omg love the pattern and colour combo!! This is such a cute outfit! 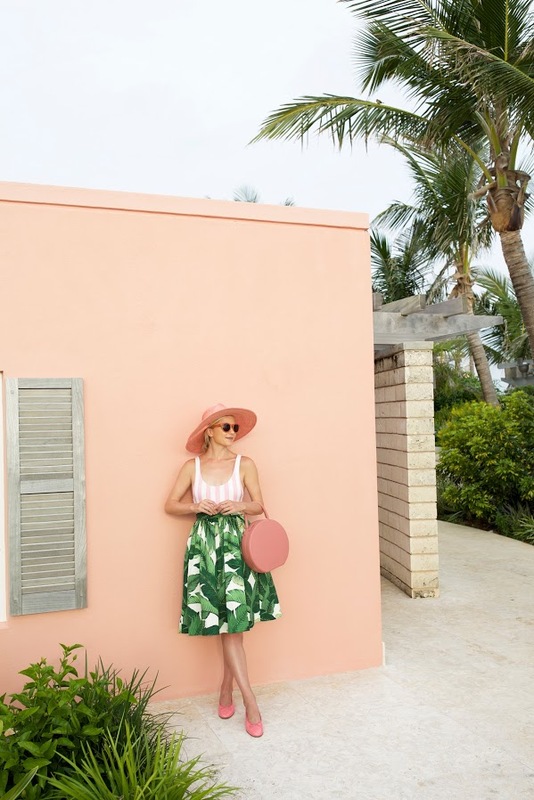 I would have never thought of pairing pinks and palm trees together! The palm print skirt is gorgeous, love the look! I LOVE how perfectly the background matches your outfit! So on point! I posted some Bermuda recomendations at my blog if you need some.. This is such a stunning outfit, I love the pattern on your skirt! Wow – what an amazing place!! I love how your wore your suit under that skirt! So practical and so pretty! This post makes me want to run to the beach!! Love how you've mixed those prints! Perfection! What a chic and ladylike outfit. I love it! You look just lovely!! I love how you mixed prints here! Beautiful look. This is so gorgeous! I love how well pink and green work together and this palm tree skirt is adorable! I absolutely love the color scheme here with the pinks and greens. Beautiful summer photos! Such a lovely look. And it fits so well with the house in the back. I'm in love with this outfit, it's amazing! You match your scenery so perfectly! Very original outfit and photos. this post it's perfect totally love it! You styled this Partyskirt so perfectly! Love the pops of pink! I hope you're having a great vaca! Such a cute outfit! 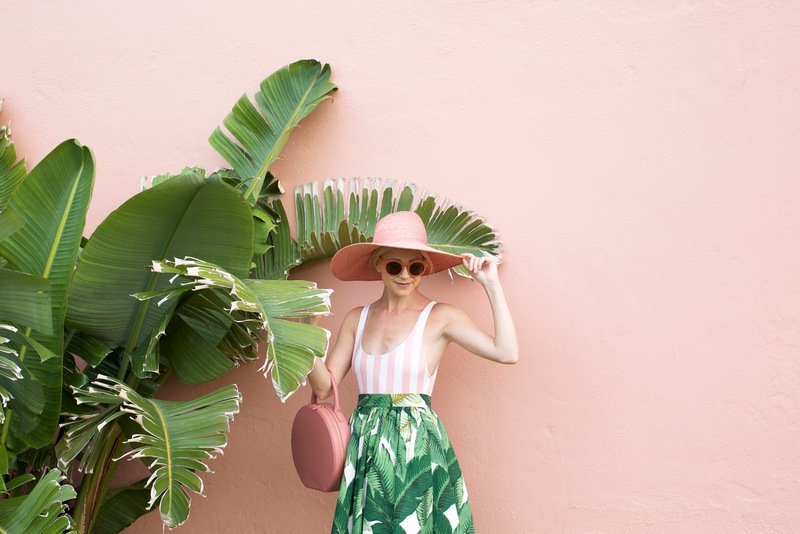 I'm so in love with the combo of the pink stripes and the palm tree print! I'm completely in love between pink & green!!! Absolutely love this look! ? What a cute pink hotel and your outfit goes so well! I love the palm print! gorgeous bag! it looks so classy and unique! Cute! I love how you wore your swimsuit as a top. Very fun piece for a tropical vacation! I always love how you mix prints and colors. So gorgeous. All I can keep saying is "wow I love this!" i love everything about this outfit. That palm leave print is so stunning juxaposed to the light pink strimed swim suit. Love the ensemble and the scenery that fits right in! I love how you've teamed together two different patterns in two different colours and they work together so well! Dig this, can't believe how killer the colors are in this post! Check out my men's stuff on my blog!